Real time tracking of cars, motos, trucks, containers etc. Extremely resistant, waterproof/weatherproof device! Are you looking for a compact, efficient and professional GPS tracker to find a vehicle position? Well, in this case Quad Track is the best choice you can make. This brand-new quad band real-time locator system has indeed a higher gear than other similar devices on the market today. For example, it allows to follow the path of a vehicle with a very impressive accuracy (it can diverge only 5m from the real position), by using the combined action of GPS/GPRS signal (A-GPS) able to redress the time latency necessary to detect the first vehicle position. Thus the system can be effectively used as an alarm tracking system too! QUAD-TRACK is at the same time very simple to program as well as to be placed under a vehicle. In fact all waypoints and coordinates are saved and sent to your chosen telephone number, so no other action is required on your side. Not only. You can also choose to automatically forward the positions to a control server, which can be reached via the Internet or app. From here you can track the vehicle movements with a very impressive accuracy. So Quad Track is not only able to withstand the most extreme vehicle vibrations, but also to operate in the most adverse weather conditions, because of its 3 powerful neodymium magnets and waterproof outer casing. Can be set and programmed remotely. For further info, specifications or price go to this page. This may be the last discover of ingenious thieves who don’t hesitate to resort to the technology to hit unsuspecting victims. The news of recent months shows several cases where someone complains of being robbed, at home or in the company, after agreeing to unknowns small gadgets, deployed on the street, particularly at the crossings or when the light is red. The hypothesis is that these gadgets (lighters, key chains or luck charms) conceal internal micro locators that are able to track the movements of the victims and, at the right time, allow to the criminals to enter in their environments and rob them. For example, it’s circulating a warning by the police which states: “These days are distributed key rings to attach inside your car. People offer them for free at parking lots or fuel distributors. Don’t accept them. They contain a microchip. 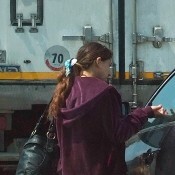 These criminals will then follow you and so they know your movements to make intrusions and thefts”. For example, it’s circulating a warning by the police which states: “These days are distributed key rings to put inside your car. People offer them for free at parking lots or fuel distributors. Don’t accept them. They contain a microchip. These criminals will follow you and so they will know your movements to the aim of intrusions and theft”. The police is therefore faced with super technological criminals even able to insert a GPS transmitter and a power source of long duration in the limited space of a keychain or any other small gadgets. Operation worthy of the best companies of espionage. Of course there is no surprise seen that in recent times, the stratagems adopted by the criminals to carry out robberies or burglaries have become increasingly refined. The police are gearing up with detectors that can evidence the presence of micro systems, impossible to recognize with the naked eye, as in the case of key rings, lighters, lucky charms and similar items. Same thing can do private individuals: use a bug detector to clean up their environments. 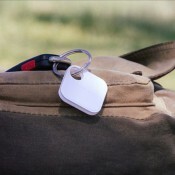 If the tracker is contained in so tiny gadget, let alone in larger objects. These micro systems come into the house through postal parcels, gifts, books and tools of all kinds. The protection has become an obligation. The geolocation is getting closer, at your fingertips. We’re all constantly losing things. Keys, bag, charger and many other tools of daily use are very often forgotten, lost. The hard part is finding them. This discomfort could be deleted with the help of geolocation devices. In particular, big companies and startups are trying to answer to the distraction effects with products that will come soon on the market. Their secret would be an accessory, a “tag”, that is applied or connect in other ways to objects. These little devices could help to find the items with geolocation through smartphone, tablet or computer. Already three products are ready, two come from start-ups and one from Nokia (exclusive to Lumia phones, upgraded to Bluetooth 4.0.). The tag shall be applied to the object you want to monitor, and from that moment, the tag will send location informations constantly. Through an application, it will be possible to identify where are the lost things at any time, with appropriate proximity alerts. Practically, the objects are tracked within fifty metres, and all positions can eventually be shared with other people. In the professional field, the geolocation tools are already used by several years. Just think of the wide range of locators proposed by Endoacustica Europe. Are devices that fit almost all needs and also acting as anti-theft for the most precious objects (cars, bikes, security luggage …). They are excellent tools for monitoring children and elderly and preserve them from the dangers. Moreover they cover a very wide field, also thanks to the identification of the location through GSM triangulation provide localization even in the absence of GPS coverage. If the objects are really valuable, better to rely on leader in the field. 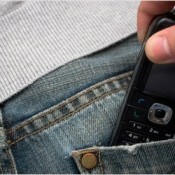 One hundred twenty thousand a year, ten thousand a month are the mobile phones stolen (or loss). These are the numbers from the homeland of mobile phones, smartphones and tablets thieves: London. The Mayor, Boris Johnson, and the police are really troubled about the weight of these statistics and asked to the same companies devices producing to investigate about what is happening. In particular, they asked to Apple, Samsung and Microsoft to study which is the mechanism to disable illegal or dubious origin smartphone. The case arose from a guy who ,in one year, has gone over 170 times in the Apple store in Regent Street asking and obtaining the replacement of “his” iPhone promptly dented. For each request he has got a new smartphone. But clearly the situation has intrigued managers, because it wasn’t a single case and, under similar circumstances, there had been also in Samsung. The three giants have proposed a “Kill Switch”, an option, that works also from a distance, that “kills” the phone, making it useless and at the same time recognizable as a product stolen from its rightful owner (a evolution of the existing application “Find My iPhone”). So to prevent that the villains, like the boy of the 170 visits, to get away and even have, thanks to the exchange used-new, a nice packed smartphone. It isn’t clear if all the companies have accepted the option. Against thieves of smartphone & co there are battles going on in different parts of the world; the American police notes 113 phones stolen (or lost) every minute, for a total of 162,000 per day. The ideas and the means to achieve the “kill switch” are there, but who knows if corporations will act in haste and by mutual agreement. Meanwhile we cannot stand with folded hands, there are already efficient devices to prevent that our smartphone is lost, along with all the sensitive data in it. Among the most reliable systems there is a software proposed by Endoacustica Europe. It’s a program that is installed on the mobile phone easily and allows to receive on another default smartphone (called pilot) the GPS location of the same. So if the smartphone is stolen you will know in a few minutes where the phone is and then get him back in your hands in few time. A solution already adopted by many people to protect the large number of personal data contained in the devices. The loss of these informations could cause damages higher than the subtraction of the same cell phone. Locate the exact position of a cell phone in enclosed spaces may become possible thanks to an algorithm that allows us to reconstruct the 3D shape of a room, listening to the echo of the sounds produced inside, even simple ones like the snap of the fingers. The project was developed by a research group at the EPFL. 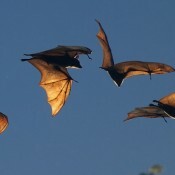 The researchers were inspired by echolocation, the system by which some animals such as bats and dolphins emit ultrasounds and register the returning echoes to locate the position of obstacles or food. In the same way, the method uses a sound source and four microphones to reconstruct a environment 3D. Each microphone picks up sound from the source and the echoes from various walls. The algorithm then compares the signal from each microphone. The signals delays are used to calculate not only the distance between the microphones, but also the distance from each microphone between the walls and the sound source, locating in an exact and precise manner. By testing the algorithm in an empty room, in which is changed the position of a movable wall, was obtained a 3D map with pinpoint accuracy. In the future, according to the research team, the method can be used to define the shape of a room by the echoes of a chat on a cell phone. Not only, the same technique could help to locate, thanks to the mobile phone, the precise location of a person in a room. Today tracking systems are widely used both for surveillance and anti theft systems. In fact, if on the one hand allow to observe the movements of cell phones and monitor people or objects, on the other allow you to track goods or valuables in case of theft or loss. The localization is one of the most useful application in our day! It’s environmental surveillance, the new frontier crossed by the fish-robot that will be released, in the coming months, in the Thames in order to sniff out pollution. Scenes like science fiction movies are recorded during the tests in the water. The robots will be released in groups of five in order to provide a mapping of the critical points and pollutant elements. The search will rely to the sensors built-in each of these strange fishes, to the GPS system and a micro camera installed in them, ensuring the exact identification of the area in which they are found. 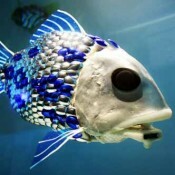 The data will instead be transmitted through Wi-Fi network, used also for a “dialogue” between these fishes-robot. The project has cost about 22,000 euros. The fish-robot seems like a carp, is one meter and a half and swim at a speed of 1m/s. Every 8 hours back to the base to recharge the batteries and start over. If the experiment will be successful, the fish may be used to combat seas pollution. The road of fish-robot was follow a few years ago, but the researchers encountered a problem: the previous version wasn’t able to swim on their own. Today, this issue should be resolved. Once again, the satellite tracking systems together with the most modern video control technologies are fundamental in the field of surveillance in small houses such as in the open sea. GPS technology has now numerous applications in daily activities. Keep an eye on the kids, monitor the pet, follow the partner’s car is a cakewalk if you have the right tools. Shortly, it will possible use a sophisticated development of GPS technology in a shopping center or on the shelves of the supermarket so you’ll save time and optimize the product comparison. To lead the tour will be our trusty smartphone through Locata, a new system of positioning and navigation that also works indoors and could become a worthy competitor for the same GPS technology. The new system has a strong accuracy margin (only 18 cm) and is still being improved. For the use of Locata is necessary to install a network of antennas on the ground. Surely, it could derive significant benefit in large cities where buildings often make difficult to locate with the traditional GPS. The U.S. Department of Defense, which in the 70s had developed the GPS, is conducting tests on a large scale in a missile plant in the desert of New Mexico. 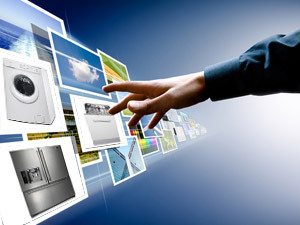 There is enthusiasm among the giants of the business for the introduction of new technology. In fact, the advertising easily will be able to take possession of it, leading the potential customer in the place where are the sponsored products. In any case, Locata and similar systems will work alongside the GPS, but for now, not replace it. In fact they are already on the market localizers able to offer very similar services, tested and efficient. It ‘s the case of the Micro GPS/GPRS Endoacustica that contains in itself the potentials of a GPS and GPRS transceiver and a satellite receiver, becoming, on occasion, an environmental bug and a speed controller. A system certainly very advanced and cheap. Web 3.0 isn’t yet far away. All the big laboratories are working hard to develop new applications concerning the Internet of things. With this neologism has been named the last frontier of online technology. The strength lies in the possibility given to objects to interact with each other by capturing and exchanging information. The alarm clock may sound for example in advance once found, through the Internet, heavy traffic conditions. And so the refrigerators could buy online the ideal food for our diet, the plants could alert the watering that they need water, the containers of medicines communicate that you forgot to take a pill. In short, all objects of common use may have access to the network by changing radically our daily life. Almost all things will possess its own IP address becoming so connected and traceable. It’s assumed that by 2015, 15 billion devices will be online. Bob Kahn, the man who together with Vinton Cerf, invented in the seventies the data transmission protocol on which is based the Web, is working in the United States in the development of the project. The goal of the Internet of things is to ensure that the electronic world draw a map of the real world, giving an electronic identity to the things and to the places in the physical environment. In short, the real objects collect environmental data, process them and interact virtually with each other through microantennas 3G, wi-fi and GPS systems. The equipments will also continue to miniaturize themselves reaching the size of the most advanced bugs for fields of application increasingly numerous. Everything will be smart, from the house to the city. An example will be the urban transport system in London: the sensors of the subway trains will signal to passengers in the carriage where there are empty seats, the parking will be on the network, so as to be sure to find a place before you get into the car, the semaphores will coordinate so as to dispose the traffic effectively. The fields of application will be numerous: from industrial ones to logistics and information services, energy efficiency, remote service and environmental protection. The stumbling block is the privacy safeguard. If all our items will be online, track our movements will be very simple, as already happens today with the most modern GPS tracking systems. It will be like wearing 24-24h a surveillance camera. The solution could be the installation of switches, if required, disabling the tracking. But these are still hypotheses, we have to wait at least 2015 in order to begin to feel first hand the pros and cons of this new technology. Pack your bags is always a problem. Weather conditions, formal and informal dresses, comfortable and casual, but also suited to special occasions that may occur…In short, a grind. And what often we create is a baggage too heavy and almost entirely useless. About 25 years ago, a pilot of the Nortwestern Airlines tried to obviate to the problem of having to lift heavy luggage introducing the trolley as we know it today: with wheels and pull-out handle. This invention forced the airlines to invest in the redesign of planes and the airports had to gear up of facilities for the wheels as the treadmills for trolley. Today, we continue to work to make the bag more durable and burglarproof. To respond to this second aspect of “antitheft” were introduced small satellite tracking systems that, placed into the baggage, allow to track it in real time. So you always know where it is and eventually realize that the trolley is taking strange ways avoiding theft or loss. 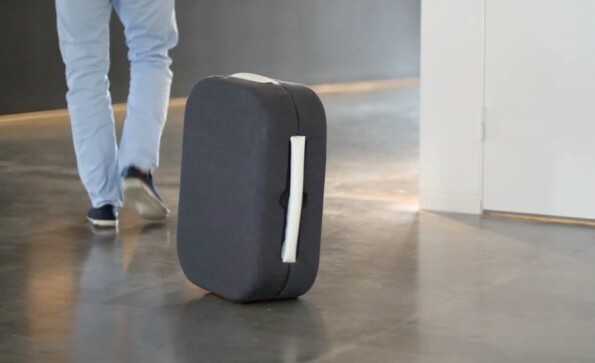 Today they still work for the evolution of the dear baggage, Rodrigo Garcia Gonzales, a young Spanish designer, has invented Hop!, a carry-on suitcase that follows its owner. The name, Hop, recalls the way in which are called the bellhops of hotels that have the task of carrying the suitcases of guests. The device works thanks to a microprocessor and three receivers able to interact, through the Bluetooth connection, with the smartphone’s owner. Activating the signal with a mobile app, the suitcase locates its owner and starts to follow him at a distance, slipping on the floors of the hub; if the signal is lost, the suitcase automatically locks itself and the phone-guide vibrates, letting the owner know the his travel companion is stuck. To avoid collisions against its owner, the suitcase moves remaining at a certain safety distance thus being more exposed to the risk of theft compared to a normal baggage and even more compared to one localized through GPS. Gonzales, to deal to this problem, has equipped it with a command that allows to the baggage to lock and close itself tightly; however, if they steal you the suitcase, the fact that they will have difficult to open it isn’t a consolation. In addition Hop! moves too slowly for the busy life of airports. In reality it is still a prototype, not yet ready for the market. Until recently, GPS tracking systems were used for the control of small animals. Now the GPS challenges even the most dangerous animals. Indeed, it is in an experimental phase the scientific mission of the American non profit association, Ocearch, led by Chris Fischer. 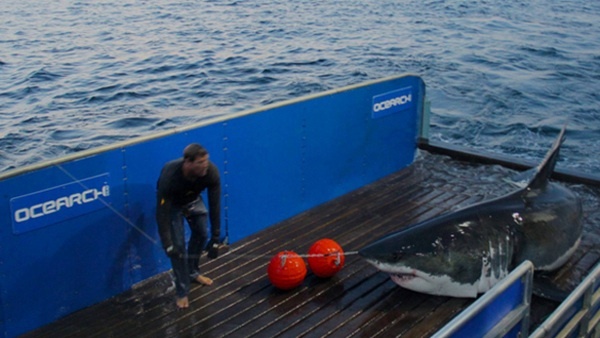 During the operation, the sharks are caught, mainly in North America, and to them is applied a GPS tracking device, then they come back to the sea. The aim of the project is to analyze the movements of dangerous aquatic predators through a satellite signal issued from the transmitter installed in their dorsal fin. At the end of the work should be created a database accessible to all via the web. Animals already cataloged can be controlled by the organization’s website, where is possible to know their characteristics and the route taken since the installation of the GPS. The new technological development would be useful also to warn people when the sharks approaching to the coast. No shortage of controversy. These have been raised concerning the techniques used to implant GPS systems. The team of Fisher, is blamed for the capture methods used. The use of hooks, especially, it’s a method that, according to some, brings animals to unnecessary trauma. It seems that a shark has even lost their lives. To really understand how animals react to the capture, the research team was followed by an expert on sharks that through the analysis of blood samples and the use of an accelerometer, has come to the conclusion that the animals have been subjected to physiological stress and which, once released, the predators are exhausted and swim slowly least for the first moments. admin su Application transforms your smartphone into a bomb detector. terry ikaye su Application transforms your smartphone into a bomb detector. Buying a bug transmitter on Amazon without knowing where it is from? Actually it is not a good idea! Which video bugs are better to use in investigation? Would you talk on a cellphone without being noticed? Now you can, with an inductive micro earpiece! A Spy Phone or GSM spy cellphone is a normal mobile phone on which has been installed a software able to reply many crucial information such as: listening of all incoming and outgoing calls from the mobile, real time phone surrounding sounds, reading of all type of messages (SMS, WhatsApp, Facebook, Viber etc..) and GPS tracking. The spy software works on the most of Android, iOS, Blackberry smartphones. Micro digital recorder able to gather evidence or discover any kind of betrayals. Recording capability of up to 1200 hours in continuous. Long duration for those recorders using voice activation system VAS. Just for you the best micro digital voice recorders on the market in terms of efficacy and reliability at a low price. Wall microphones able to listen through walls thick even up to 70 cm. Ultra sensitive professional stereo microphone, suitable to pick up the lowest noises thanks to its very high sensitive ceramic microphone. Limpid and stable sound. Endowed with sockets for recorder and earpiece. The phone voice changers when interposed between handset and phone, will change your voice into another one. It transforms any voice into a masculine, feminine, adult or child one.The voice changer can be adapted to cell phones, cordless phones, speakers and microphones, recording systems, or connected to switchboards. The reproduced voice is not a robotic but a human one. Real time trackers are designed for those who need to keep their pets under control, while limiting the relevant cost, but also to locate precious objects or to remember where you parked your car. Anti-drowning defender is an alarm device which combines anti-drowning and anti-loss alarm, and works effectively as an electronic safety device for protecting children or pets from drowning and loss.